After years of travel, it was time to upgrade some of my luggage. After reading about the best travel suitcase brands and various online suitcase reviews, I realised I know more than all of them. So I’ve written my own guide! Whilst I don’t necessarily need the top suitcase money can buy, I don’t want one of the cheap suitcases either. Basically, I want a good quality suitcase that is perfect for my family’s travel needs without costing me a fortune. Suitcase options can be a little overwhelming with their various features, weights and prices, I know I have bought various pieces of cheap luggage in the past only to discover they weren’t right for us. Click here to see the best suitcase now. 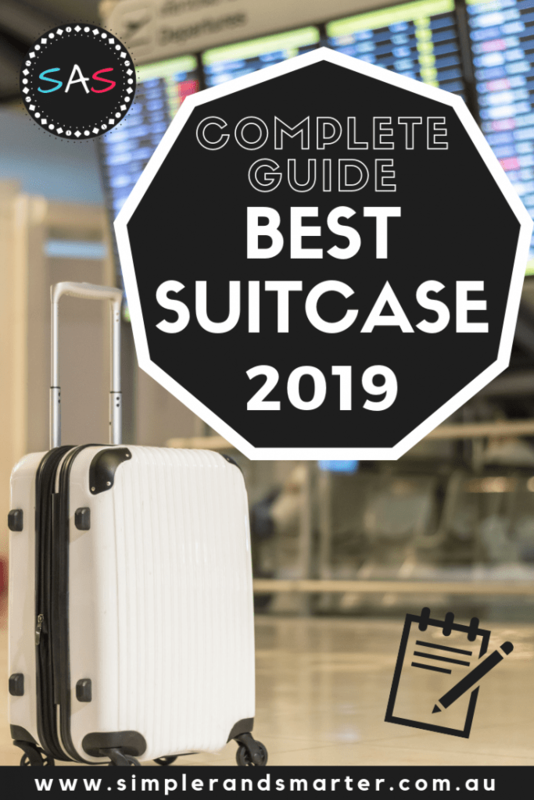 I’ve put together this guide to help you understand what you should consider when purchasing your own suitcase and, with various suitcase reviews from the top suitcase brands, will help you find the best suitcase 2019. Handy reference list – see all suitcase reviews below! As I mentioned, I have bought various pieces of luggage over the years thinking they would make the best suitcases for overseas travel, only to later realise they didn’t quite meet our family’s travel needs. To purchase the best suitcase for international travel, or any sort of travel, it is important to give special consideration to various things and not just buy the first cheap large suitcases you find. If you are travelling with children, consider whether it be your only checked in piece of luggage or will you check in other luggage too? Think about the airline you are flying with and what their restrictions are around checked in luggage?. I talk about these various things and more below to help you in deciding which are the best suitcases to buy for family. When purchasing online suitcase deals, don’t just look at the suitcase price, it is important to do your homework before making your purchase so you are not disappointed when your bag is delivered. One of the most important considerations is the size of the suitcase. With many airlines now charging per bag checked in, many families are saving money by only checking in one or two pieces of luggage for the entire family. If you want to save money by following suit you will need to consider what size suitcase (or suitcases) will fit your entire family’s belongings. Even without being concerned about saving money by minimising checked in baggage, when travelling with younger children, it quite often is a better idea to have one or two large suitcases then multiple smaller suitcases. This means you have less to transport around and more hands available to look after the little ones. With many airlines being strict on the weight of checked baggage it is super important to choose luggage which is lightweight. Some bags eat heavily into your precious baggage allowance. If your bag is over the limit you may be asked to pay hefty excess baggage charges. The best lightweight suitcase is going to be easier to transport around, not only in airports but whilst you are making your way to your hotel or around busy cities. In the below best suitcases reviews I have included various options for the best lightweight checked suitcase, and the table above includes the weight of all suitcase Australia reviews below. When wheeling a suitcase around a busy airport or whilst reaching your destination, you want luggage that is easy to manoeuvre. Believe me it is worth investing a little extra for this, particularly if you are travelling with children. Luggage that doesn’t easily go where you want it to will leave you frustrated and stressed before you even board your plane. A two wheel suitcase, also known as a roller, requires you to tilt the suitcase to wheel it and it doesn’t easily go around corners or through narrow spaces. They also have a tendency to fall over when left unaided and are impossible to pull more than one. However there are some advantages. Two wheel suitcases are usually easier to pull behind you and quite often once you leave the airport you will tend to want to pull your case rather than push it. Two wheel cases tend to be able to handle cobblestones and uneven surfaces much better than other cases. If you are looking at buying cheap lightweight suitcases, chances are they will be rollers. Four-wheel suitcases, also known as spinners, are now becoming the standard and are far easier to maneuver around busy airports. Having four wheels means the suitcase can easily move in any direction, including going around corners with ease. A light push on the handle is all that is usually required to move the suitcase around the airport. This is super practical particularly when travelling with small children as you are not required to hold any of the weight. Four wheeled suitcases are also far easier wheeling through a narrow aisle than two wheeled suitcases. Some suitcases even come with eight wheels, these are referred to has double spinners. Ever waited at the airport carousel only to see a million bags that look just like yours? This is why I highly recommend you buy the brightest suitcase you can find so you can easily recognise it. This also prevents the chances of someone else thinking it is their bag. Suitcases take a bit of a beating when in transit. Whether you are dragging it down cobblestone streets, across uneven surfaces or being loaded and unloaded on airplanes, buses and cars your suitcase needs to be durable enough to withstand these encounters. You don’t want a big gaping hole in your bag mid-way through your trip, so it is worth investing in a bag that is proven to be durable. This leads to the question – are soft shell or hard shell suitcases best? Soft shell bags are more common and are much easier to squeeze into overhead compartments or tight spaces than the hard shell bags, but they’re also less likely to be waterproof. However the best hard case suitcase will provide better protection for your belongings and will nearly always be water resistant, which is important considering the battering your bag can take in transit. The disadvantage with a hard shell suitcase is that it is likely to weigh more than a soft shell case. If you prefer a hard shell suitcase be sure to look for a lightweight one, as you don’t want to use too many of those precious kilograms for your suitcase in lieu of your items. Of course another great advantage of having the best hard shell suitcase is having your own portable seat when waiting in unexpected lines or anywhere that doesn’t have seats – perfect for families travelling with young children. It’s important that your luggage has an easy to use handle. Some handles can be difficult to use in that they don’t retract quickly and easily which is not ideal when you are walking through a busy airport or trying to load your bag quickly onto an airplane. Your suitcase should also have additional top and side carry handles so you can easily pick it up to load into airplane overhead compartments as well as in and out the car. Suitcases with expandable compartments are great. Expandable compartments provide you a place to store your various purchases during your travels. No need to buy an additional bag, you simply unzip the expandable compartment for more space. The Delsey Paris Grenelle from Delsey Luggage Australia is a fantastic hard case bag. This great sized bag is made of a lightweight and durable material. For security conscious travellers, there is a side mounted TSA lock which is designed for airport personal to open your bag without damaging it. The double spinner wheels as well as the two-position handle system make manoeuvring around the airport easy. This is a perfect choice as the best large suitcase for families or for regular business travellers wanting to get around the airport quickly. Other great features include the expandable pocket perfect for storing those souvenirs you purchase while travelling as well as removable and washable lining, perfect for organising all your belongings. There are two side handles perfect for carrying the case when required such as lifting it into overhead bins or in and out of the car. This is a great mid-range bag which you will note is well recommended when you read any Delsey luggage review. Wondering where to buy suitcases from? Samsonite is always a winner and the Cosmolite 3 is a great option for those looking for the best medium suitcase. This stylish hard case is made to absorb impacts by flexing and popping back into shape, so there is no need to worry about unsightly dints or damage to the contents while in transit. The brushed pattern is designed to hide any unsightly scratches that may occur. The interior is fully-lined, with organizational pockets and cross-straps to keep your belongings in place, and includes a side-mounted TSA approved lock. This suitcase is one of the best Samsonite luggage options and comes in several attractive colours. This suitcase will definitely stand out on the baggage carousel. One of the strongest expandable suitcases to manoeuvre through busy airports is the Eagle Creek Expanse. 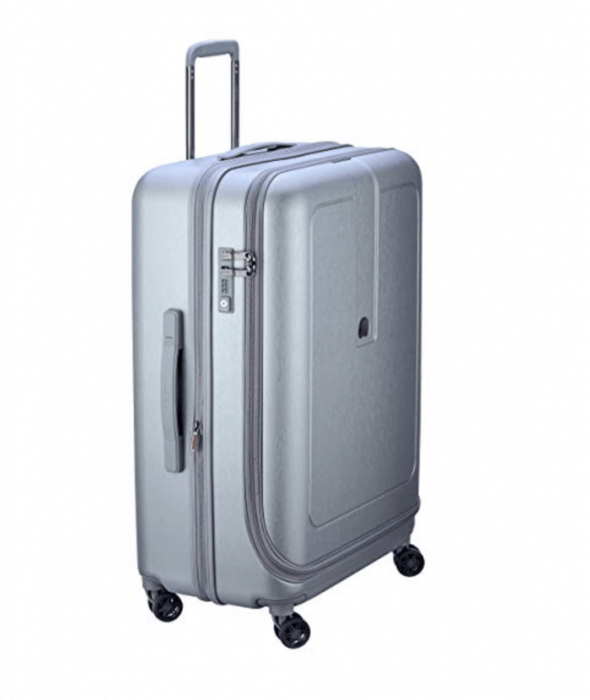 This particular suitcase has 4 self aligning wheels which gives a super smooth 360 degree roll and a sturdy frame which makes getting through busy airports and car parks a breeze. We love that the sides aren’t rigid so we can squeeze more in. This suitcase is also made from premium, ultra-durable fabrics which are made for the reality of travel. It has durable zipper heads, built in accessory and interior pocket, and multiple places where you can grab the bag for easy access. This suitcase is so comfortable and easy to get around that you won’t even be in a rush to check your luggage in. This stylish and fashionable lightweight suitcase is a great option for separating your luggage from the rest. This American Tourister suitcase comes in several colours and not only does it look fantastic, but it is also comfortable to get around with. It has excellent mobility with it’s four, multi-directional low spinner wheels and rolls upright to ease the extra weight on your arm or shoulder. Other features in addition to being super lightweight and having four wheels, is the push-button locking handle and the range of different sized pockets. This suitcase is also expandable for extra storage space and has internal webbing for compartmentalising. According to suitcases reviews, the different colours make it easy to spot at the baggage collection as you can’t miss it on the belt and the spinner wheels make it a breeze to get around airports. No wonder it’s among the best suitcase for travelling from one of the best luggage brands. The Antler Oxygen suitcase is an ultra-lightweight bag with many other great features. Made from durable material, the excellent construction of this case allows you to flat pack all your luggage to enjoy crease-free packing. This makes it the best suitcase for suits. Getting this case around airports is also very easy with the 4 easy-glide spinner wheels and as well as a unique recessed handle area. The spacious front pocket is great for last minute items or things you need easy access to. Other features of this stylish and functional case are the top and side carry handles for easy lifting, a mesh zip pocket and side impact protection. This case leaves most people impressed and has been highly recommend if you are looking to buy cheap suitcases but of above average quality. The Samsonite B-Lite is a super lightweight suitcase with all the features. Not only does this case look great, it is sure to stay looking that way as it’s made of tear resistant nylon that can withstand the harshest travel elements. Your belongings are protected by the TSA lock, and the suitcase includes divider and cross-straps for packing organisation. Another features include a total of 8 360-degree spinner wheels, full zip interior and the ability to expand the case. According to Samsonite luggage reviews, this is a very good quality suitcase and, with a 10 year warranty, you can rest assured it will last. The Desley Paris Montrouge is a toughly made suitcase with a great organisation system. These medium sized suitcases are made from such a tough construction which is remarkable considering how lightweight it is. You won’t have to worry about your suitcase getting damaged in transit and can be sure all your belongings are safe as well. With plenty of compartments for storage this suitcase is great for organising all your luggage and makes for super easy unpacking at the other end. Other features include the silent gliding four wheels, an address holder and a TSA approved security lock. This suitcase also expands an additional 3 cm. This is the perfect bag for someone looking for all the features of a high class suitcase. The Victorinox Spectra suitcase is perfect for those travellers that want a top of the range lightweight case. This is one of the lightest hard cases in these reviews, weighing in at only 3.98 kg you will have plenty of baggage allowance left over for your belongings. Inside the case are zippered mesh dividers so you can easily organise your items as well keeping them in place with the compression straps. Made from top quality polycarbonate, this case is break resistant, scratch resistant as well super stylish. The case also includes corner guards and zipper bumpers to provide added protection to areas which are prone to impact. Other great features of this hard case include dual caster wheels providing 360 maneuverability and zero weight in hand, aluminium handle that locks into three different positions as well as a top handle for carrying, TSA approved lock removable ID tag and a 10-year warranty. It’s on the expensive side but you do get quality. The Osprey Rolling Transporter is one of the best large suitcase options within these reviews with many great features. A bit different from your standard suitcase, this case is lightweight as well as being high-strength, and designed to be resilient through harsh travel environments. With compression straps and large interior mesh pockets, this case takes all the good things about the best backpacking bags and squeezes them into a suitcase frame for super convenient travel. The 2 all terrain wheels are super sturdy, and the fabric is highly water resistant making it great for harsh environments and great for any sort of travel. The American Tourist Curio is ultra secure as well as being one of the best hard suitcases on the market. This has to be one of the safest suitcases available made of strong polypropylene with an ultra secure interlocking aluminium frame for ultimate protection of your luggage. It is impact proof and scratch resistant and also has a combination TSA Lock with a twin point latch for added security. It also has 360-degree maneuverability, and easy-grab top and side handles. The interior is fully lined and has 2 tie-down straps, central dividers and zippered mesh pockets, making it easy to organise your luggage and keep it that way. There are also several bright colours to choose from so that it can stand out from the rest. Among American Tourister reviews, this suitcase is a standout and offers great value for money. 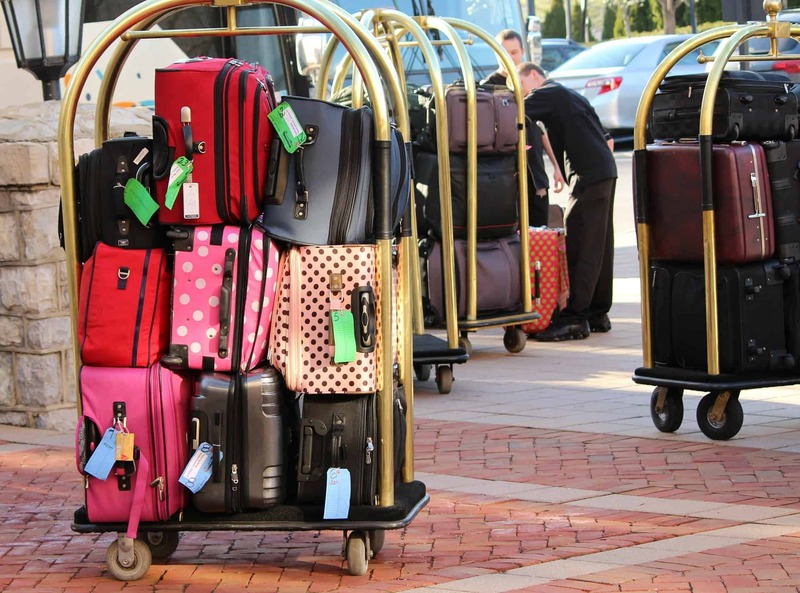 Something you may have noticed in luggage reviews Australia 2019 is that much of the best travel luggage is pricey. But the best suitcases Australia offers needn’t be pricey – you can find a good quality cheap hard shell suitcase online, like the Newcom. This particular suitcase has faired well in suitcases reviews Australia due to quality construction with a scratch resistant design. In addition, it also features a unique system whereby weight is distributed more efficiently, in combination with 4 smooth spinner wheels, something not always seen in cheap, hard shell suitcases. Its size makes it among the best carry on luggage Australia offers for shorter journeys, and with an attached lock is one of the top cheap suitcases online Australia. Top quality construction is important, especially when you buy cheap suitcases online, which is why going with a known brand like Flylite offers some protection. 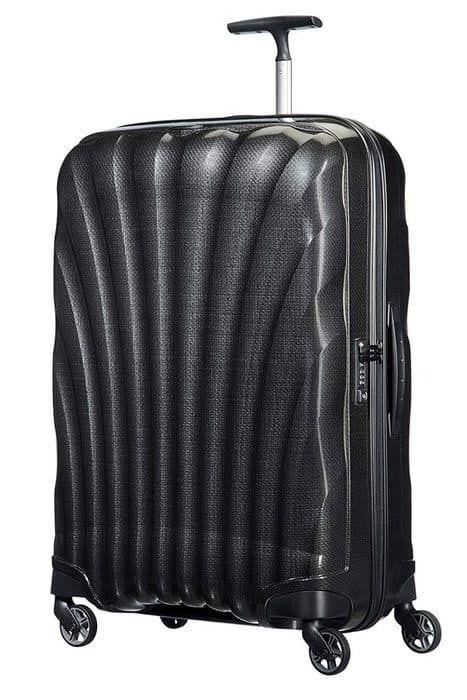 Luggage reviews Australia have rated this product favourably due to its top quality poly-carbonate construction which features a 15 year warranty, which you’ll often find with the best suitcase brands Australia. Suitcase reviews Australia have also remarked on the aesthetics of this particular suitcase, with a modern and attractive exterior making it easy to locate at the airport. The interior is similar to other best luggage Australia options with a simple separator and zip. With the addition of one of the the best suitcase locks, we’ve found this a quality but cheap hard suitcase Australia offers. Looking for some packing cubes to go with your suitcase? Packing cubes make staying organised so much easy. Read this guide for the best packing cubes. Looking for other travel accessories? Read about the best travel backpack or check out our other buying guides here.